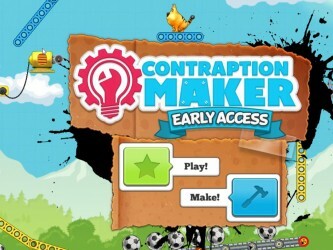 This article contains coverage of a preview build of Contraption Maker. The opinions expressed below pertain to a piece of software in Alpha (Build 1) state, and may deal with features which are in an incomplete or prototype form. The coverage below is intended to provide a general impression of the game in its present state, and may or may not apply to the finished game. The Incredible Machine was a favorite of mine back when I first started messing with computers. I fondly remember going over the house of a friend (now a fellow BrainLazy staffer) to build ridiculous machines that would make Rube Goldberg proud. 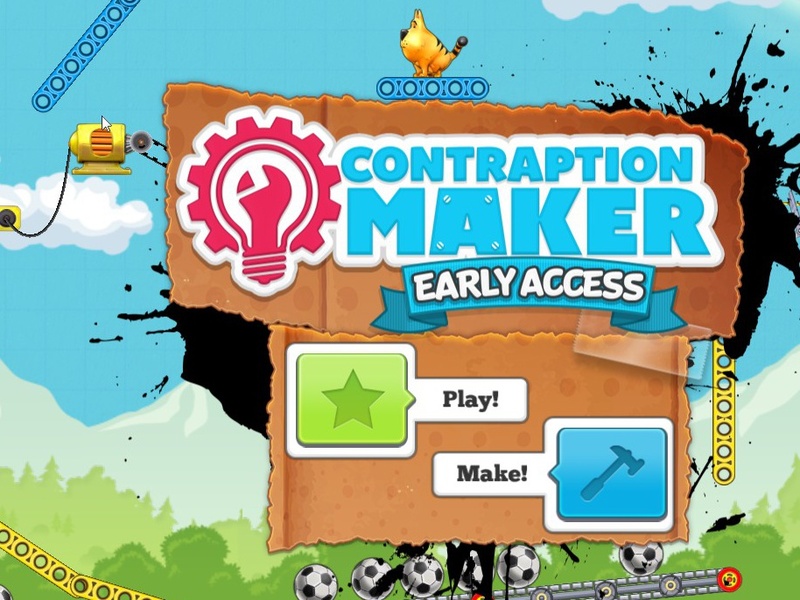 Contraption Maker, after a single glimpse, was clearly the return of the game that targeted the my madcap engineering instincts. I had to give it a try. In keeping with the zany tone of the game, the graphics are decidedly cartoon flavored. Everything is bright and colorful, and the various components trend toward things that would be at home in a toybox. The primary platforms look like struts from a Lego Technics kit, there are jack-in-the-boxes, spring-loaded fists, and balls of all sizes and elasticities. 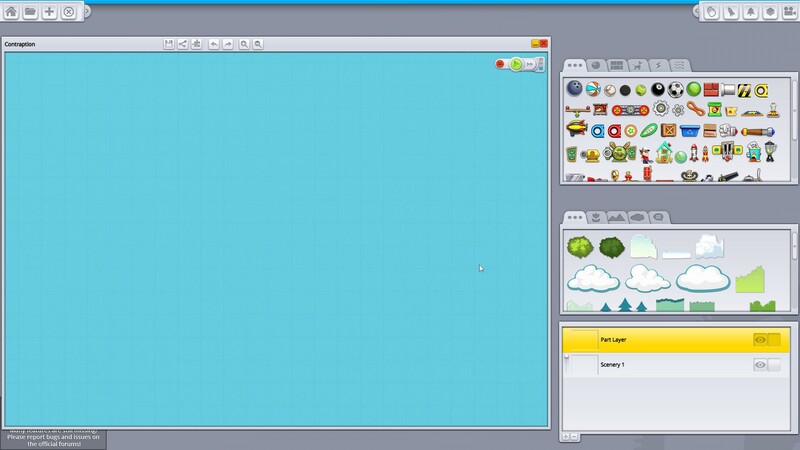 In its current state, Contraption Maker is a little light on characters, though you do get a little animated man named Tim (heh, Tim, I see what they did there) and a cat. This sort of stuff is going on in my head all the time. 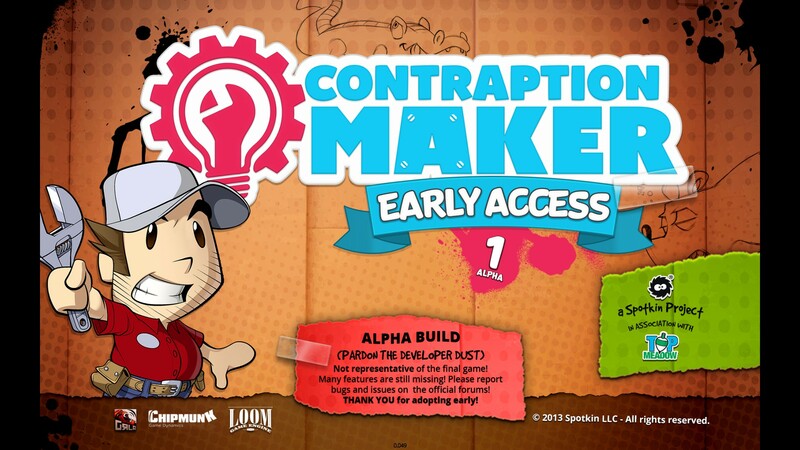 The focus of the alpha is the contraption creation, so UI is extremely important, and I must say I’m impressed. 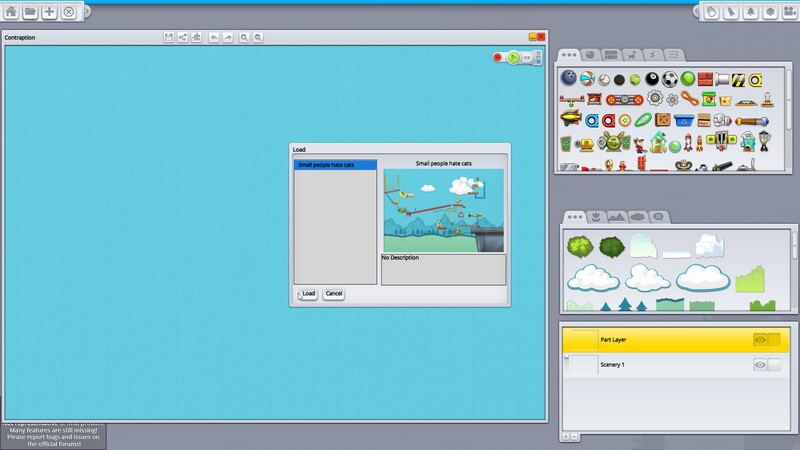 Contraption Maker practically gives you a gadget-centric operating system. 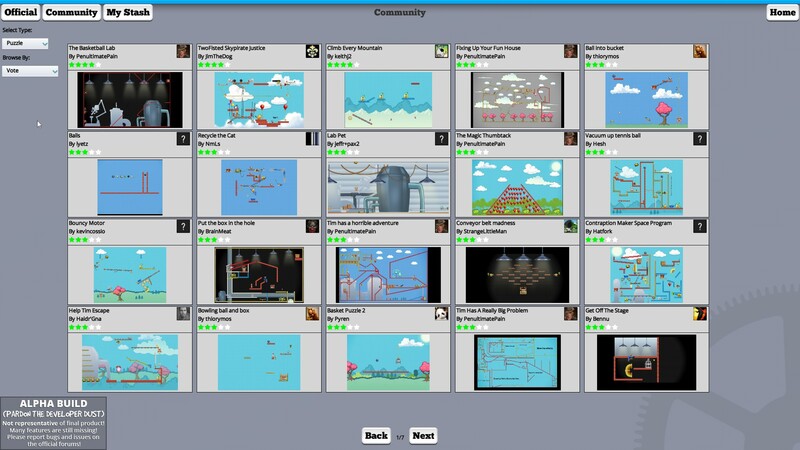 Contraptions are built in a window with various options and menus along the top it, as well as along the top of the screen. The components are along the side, sorted into appropriate tabs, and everything can be moved around as though this was just another drafting program. It really feels less like a game and more like some sort of insane design tool. Very effective, slick, and intuitive. And because I’m a sucker for this stuff, when you’re moving a component around in the design view, extension cords dangle with real physics, which was good for an extra point on the score in my personal tally. At this state in the development, this is strictly a tool set, with no built-in puzzles yet. You can save and share puzzles, and you can play those puzzles shared by others, but already the charm and functionality is in full force. 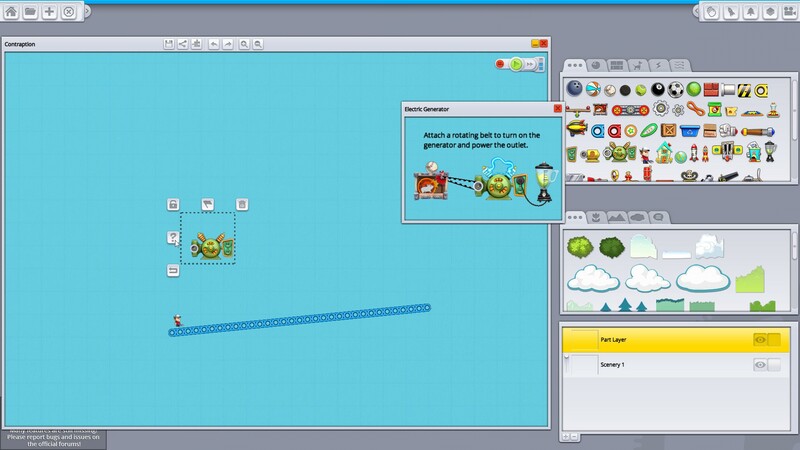 The “Rube Goldberg OS” feel extends into functionality nicely. Everything is fantastically simple and clear. Want to add a piece? Drag and drop. Want to see what a piece does? There’s a little “?” that shows you a short video of the piece in practice, along with a description. Resizing, rotating, and flipping are as simple as clicking an arrow or dragging an endpoint. Components snap together to line up their ends, plugs jump into the nearest outlets, visual indicators of range show up for anything that has limited reach. It is all brilliant. It's true. Small people hate cats. That's just science. The “pardon our developer dust” screen insists that there are more features and items on the way, but the lineup they have is already quite robust. The game allows you to save things as either puzzles or contraptions, with the difference being the presence or absence of a goal. I lean more toward the contraption creation myself, but setting a goal is as simple as selecting an item, clicking the goal button, and choosing a success condition. Pop the balloon, lead Tim to the house, turn on a blender, whatever you like. Once you’ve got a functioning puzzle, the time has come to pretty things up, and there’s an assortment of scenery items to do the job. It was while I was messing around with said scenery that I discovered their layer system. You can organize layers of parts and scenes, turning visibility on and off to keep things simple and dragging the layers around to choose which is on top. It was almost as fun decorating as it was to make the contraption. If there is a flaw at this stage, and it is a minor one, it is that the machines aren’t 100% flawlessly repeatable. Don’t get me wrong. While I was constructing my cat annihilation machine, once I tweaked it sufficiently it was quite reliable, but there were aspects of the build that didn’t quite happen the same way twice early on. Considering the ridiculous solutions I used to put together in The Incredible Machine, that’s the sort of thing that could get frustrating for me if I wanted to show off my clever solution to a friend only to have it not work upon replay. It has all of the sounds you need, plus a catchy cartoony soundtrack. Sufficient. As far as I’m concerned, at this stage, you’re making your own story. In my case, Tiny Tim sees a cat and realizes the mortal danger he is in, so he executes plan alpha, unleashing a barrage of baseballs, then coaxing it into position for disposal. Action, tragedy, drama. Everything you need, I say. 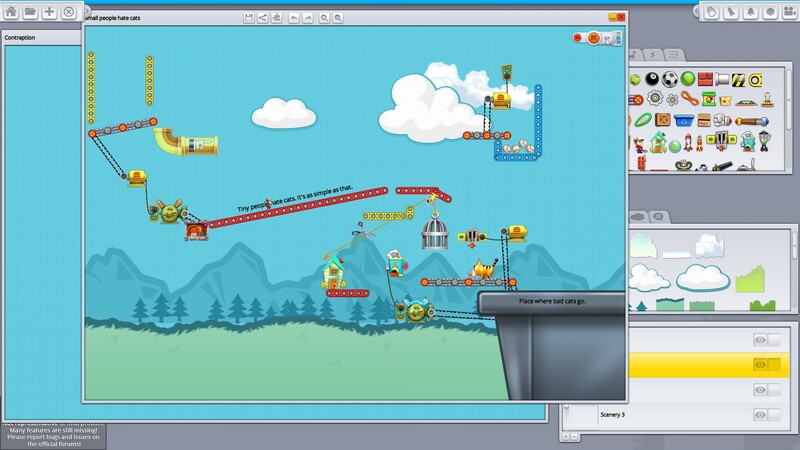 Contraption Maker is catnip for engineers, a phenomenal implementation of an age old formula. Bravo. I’m a developer on this game, thanks for the preview and I’m glad to see you like it so far! The cat had a few problems that was affecting the physics determinism and causing things to run differently each time. We have a build hitting next week that should fix this problem. If you ever have any weird determinism issues like this, upload your affected contraption to the workshop and leave us a message on the forums. We want to fix all of these as they come up. Have fun and keep building!